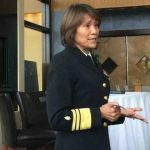 The Defense Health Agency views the military’s transition to a new commercial electronic health record system as one path for the armed forces to design healthcare in a way more centered around a model based on interoperability and centered around patients, DHA’s director told the Potomac Officers Club Tuesday. U.S. Navy Vice Adm. Raquel Bono, who joined the agency in September 2015, told an audience of contracting and government executives in Falls Church, Virginia DHA sees the Defense Healthcare Management System Modernization program — awarded to a Leidos-led (NYSE: LDOS) team in July — as “more than just an IT tool” in the agency’s larger healthcare redesign effort. Bono focused her remarks to the POC around interoperability and said that concept is challenged by differences in standards across healthcare systems in government and the private sector, which she said leads to disjointed access caregivers have to patient information. “Interoperability is about having the ability to work across a lot of different systems and capabilities and not having to stitch everything up all the time, ” she said. “We have to define value around what’s important to our patients and design around them. Bono also described the push toward healthcare data interoperability as one that aims to shift some burdens away from the patient as they are often required to take leave from work or reserve personal time to get the care they need.